Antoine FORQUERAY / Jean-Baptiste FORQUERAY: Pièces de Viole mises en Pièces de Clavecin (1747). Ketil Haugsand (hpsi). Simax PSC 1317 (2 CDs) (http://www.simax.no/). Distributed in the US by Naxos (http://www.naxos.com/). Antoine FORQUERAY / Jean-Baptiste FORQUERAY: Pièces de Viole mises en Pièces de Clavecin (1747). Michael Borgstede (hpsi). Brilliant Classics 94108 (2 CDs) (http://www.brilliantclassics.com/). Distributed in the US by Naxos (http://www.naxos.com/). Antoine FORQUERAY / Jean-Baptiste FORQUERAY: Pièces de viole avec la basse continuë (1747). Paolo Pandolfo, Guido Balestracci (viola da gamba), Rolf Lislevand, Eduardo Egüez (theorbo, Baroque guitar), Guido Morini (hpsi). Glossa GCD 920412 (2 CDs) (http://www.glossamusic.com/). Distributed in the US by Qualiton (http://www.qualiton.com/). It has been a wonderful year for Forqueray: Two fresh releases paved the way for a desperately desired reissue. The greatest viol players in the French court were Marin Marais and Antoine Forqueray (1671-1745). The former was known to have played like an angel, whereas the latter reputedly inclined towards the lower circles. It is well established that Antoine was cruel to his musician son, contriving to have him arrested and later banished on false charges. However, when Jean-Baptiste (1699-1782) published these five suites, he attributed a majority to his father who had died two years before. We know the viol suites came first, given the harpsichord’s title, Pièces de Viole mises en Pièces de Clavecin. 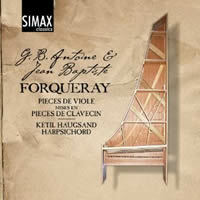 Atypical harpsichord music, the keyboard suites reflect their viol provenance and rarely escape the tenor tessitura. No one dares transpose them and so they rumble in the instrument’s belly. 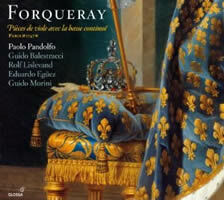 Dwarfed by Marais’ legacy, the Forqueray name lives on due to J.B.’s compilation and shrewd marketing. Which version is preferable? Both can captivate. Purists will hear the harpsichord as a poor representation of the richer viol original. This music, like other adventurous works of the period (Rameau’s Zaïs, Royer’s Le Vertigo), aspires to exceed its scoring. Poignant harmonies, florid arpeggios and brisk runs demand expressive variety and can tax a single player’s capabilities. Increased familiarity will uncover incompleteness; thus the versions complement each other. I had thought to compare multiple readings of what might be the most popular suite, the Fifth in C minor. At just over 30 minutes, the longest suite contains several of the most striking pieces: La Guignon with its chromatic climb, the dolefully simple La Montigni and Jupiter with its thunderbolts. Selections from other suites require examination: La Mandoline in the Second, which shouldn’t sound like either harpsichord or viol, and the same suite’s closing La Buisson, bucolic and tender. Recitalists duly excerpt the homages: Suite No. 1 contains La Forqueray and the concluding La Couperin. La Leclair dramatically brightens the Second, and a severe La Rameau opens the Fifth. The Fourth suite convinces least despite the frisky La Marella and the haunting Le Carillon de Passy repeated da capo around La Latour. Haugsand built his own double-manual late-Flemish instrument in 1971, purposefully channeling his frustration at the waiting lists of the time. Recorded in 2010, his stately execution offers slight flexibility. 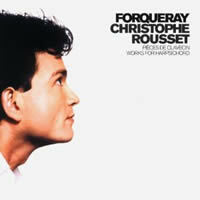 He brushes past Forqueray’s piquant harmony as in La Portugaise’s off-color accidentals. 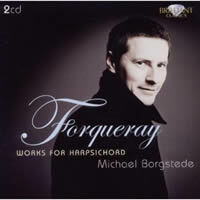 Borgstede plays a Fabrizio Acanfora / Thomas Power modeled on a Taskin tuned to a temperament suggested by Rameau. His 2008 regal reading is more supple than Haugsand. Generally Borgstede takes more time everywhere and is amenable to repeats. His two discs program the suites non-consecutively: 4, 2, 1, 3 and 5 with No. 1 straddling the discs. Should you be keeping track, in the Fourth suite, the Carillon de Passy da capo isn’t a separate cut but included within La Latour. While we’re here to discuss Pièces de Clavecin, Glossa’s reissue of Pandolfo’s Forqueray for viol and continuo must be acknowledged as an event. Pandolfo effortlessly dispatches these supposedly difficult pieces. Not just because varied continuo support offers more potential do we hear more nuances. La Cottin’s harpsichord sibling often strikes as gentle filler between the more extroverted La Forqueray and La Bellmont. Pandolfo charts a remarkably different scheme, fleshing out La Cottin and whispering intimately through La Bellmont. Where the keyboard player has octaves and forceful chords under broken arpeggios, the viol must do with a halting line and apply curvaceous grace. Gustav Leonhardt has traversed this terrain repeatedly and may be one of the few to have documented both versions. Courtesy of the benevolent Internet community, it is possible to spy upon Leonhardt’s 1976 solo LP. On a 1973 David Rubio after Taskin, Leonhardt offers several homages (La Forqueray, La Couperin, La Leclair, La Marella and La Rameau) among his neat dozen. A different 1991 CD release (Sony SK 48 080) peels out dry selections from the Third and Fourth suites. I missed Leonhardt’s prior concertante thinking in which he found tuttis and solos in La Rameau and La Guignon. 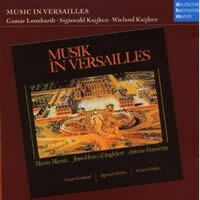 A 1970 Deutsche Harmonia Mundi program, “Musik in Versailles,” (DHM 82876 70040 2) recently bundled as CD 14 in the short-lived “Gustav Leonhardt Jubilee Edition” (Sony 88697318972), delivers the entire Fifth for viol plus continuo with Sigiswald and Wieland Kuijken. The trio’s clinical delivery suggests an indifferent carriage bolting through France with the curtains down. Another necessary data point may be Christophe Rousset’s 1999 recording (Decca 466 976-2) on the Henri Hemsch in the Musée de la Musique in the Cité de la Musique, Paris, long since expired but recut by ArkivMusic as OIS 466976. The gravelly demeanor lacks depth, the rolled chords suggesting grappling wrestlers. Surprises include forthright vigor in La Leclair and an adamant La Mandoline. I am a big Rousset fan but am obliged to describe this collection as deeply flawed. The Fifth sounds unprepared: La Guignon passes shoddily, and a tedious La Sylvia arrives at a hasty Jupiter. It’s incomprehensible that Rousset ignores Jupiter’s showpiece potential. 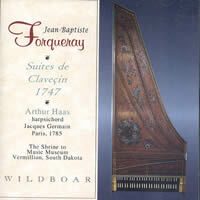 Stepping further back in time, an obsessive might venture to the National Music Museum in South Dakota which houses the 1785 Jacques Germain that Arthur Haas plays on his 1992 program (Wildboar WLBR 9201). Haas provides just the Second and Fifth suites intermingling Duphly and Rameau’s La Forqueray homages. The disc can be procured online from the Museum (http://orgs.usd.edu/nmm/). Wearing its age much better than Rousset, Haas takes a clear-headed approach without being too conservative. The quirkiest Forqueray of all time must be Rannou’s 2007 release (Zig-Zag Territoires ZZT080301.2) with the most languid tempos despite convincing responses to the music’s moods. Her Forqueray makes an unconventional if not misguided introduction, even though she has penetrated the cracks in the harpsichord’s flawed transcription better than anyone else. A close examination of both versions led to subtle revoicing and further adjustments, such as incorporating blunt clusters into La Portugaise when others stick with the indicated grace notes. 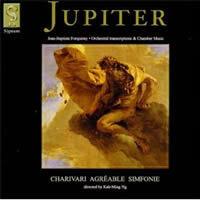 Eager to sample any curious orchestration, I sought Charivari Agréable’s 1999 program (Signum SIGCD008). The Oxford troupe organized 14 pièces into four groups, transplanting the music from France to Italy and parceling Forqueray into fast-slow-fast concerto-like divertissements. The program’s title work, Jupiter opens a triptych concluding with La Silva (V) and La Buisson (II). The second group takes La Bouron, La Dubreüil and La Leclair from II, the third extracts La Clément, the Sarabande and La Sainscy from IV, and the largest fourth divertissement pulls La Tronchin, La Angrave, La Du Vaucel and the La Morangis ou La Plissay from III with the First’s La Cottin in the second spot. The third divertissement and the last parts of the fourth are apportioned for viols and continuo. Slightly more than half the pieces are “orchestrations” which add violin and / or viola. Jupiter aspires to greatness with thunderous tremolos; however, the rondeau theme remains unadorned in the tenor region. Given their resources, I don’t understand why they didn’t play with registration after the initial statement. Some transcriptions do depart dramatically from the viol suites. I expect that players took similar liberties in the 18th century. La Leclair mimics its namesake with a lead violin, with unnecessary ornaments festooning Forqueray’s severe yet effective progressions. Cycling through these releases established favorites. A clean interpretation asserts Borgstede’s position as pack leader. Rannou comes in second thanks to her penetrating eccentricity. Haugsand narrowly betters Rousset, simply because the latter’s haste produces missed opportunities. Everyone relishes Jupiter’s demands for bravado, with the exception of an uncharacteristically indifferent Rousset. If completes aren’t necessary, then look for Haas. Meyerson’s subset is worth a spin simply because it’s filler to a fine Rameau Pièces de Clavecin en Concerts. Charivari Agréable provides entertainment at the expense of what makes Forqueray distinctive. 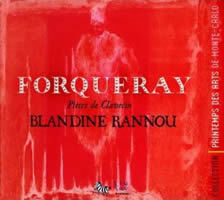 Despite the Pièces de Clavecin umbrella, I have to make the strongest case for Pandolfo’s delivery of the most authentic and captivating Forqueray.